It was a simple idea that turned into something wonderful. Several months ago, John and I were being lazybones on vacation when I started reading a magazine article filled with various and sundry chili recipes. Since we both love chili, I started reading all the titles and descriptions out loud. That started a conversation about how much fun it would be to have our friends over for some chili. And thus, the Great Chili Cook-Off was born. When we started e-mailing invitations, some friends were very excited and could not wait to share their favorite chili and cornbread recipes. Other friends got a little anxious-what if they didn’t have a favorite chili recipe? Or even like chili? Could they still join us? Would there be a competition? We quickly reassured everyone that if chili wasn’t in their recipe repertoire, a dessert or salad, a bottle of wine or a sampler of beer would do just as nicely. Our main goal was to have our nearby friends come together for a relaxing Sunday afternoon of food and friendship. John and I started furiously mixing and simmering our three chili recipes of choice. John went with his old tried and true basic chili recipe from his beloved, much used Pillsbury cookbook. Since it turned out a bit thick and sludgy, he thinned it with a few healthy splashes of red wine. 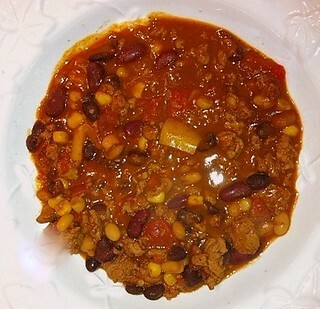 For our second recipe, we decided to mix the spicy and sweet by making Smoked Turkey Mango Chili from one of my favorite cooking for a crowd websites, the Reluctant Entertainer. 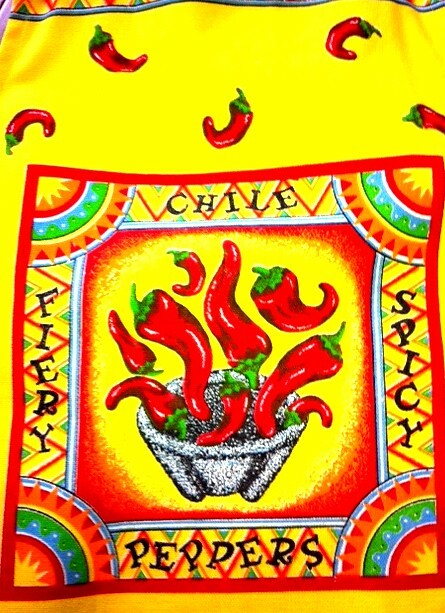 Our third choice was from the original Midwest Living magazine article that inspired the chili party, “What’s the Secret” chili, it featured a spicy mix involving the marriage of hot Italian sausage, chili powder, ground turkey and cocoa, among other things. On the day of the party, there was chili and a whole lot more. We had nine savory varieties of chili, including several chicken chili choices. Rich Kentucky Spoon Bread also made an appearance, together with corn bread, honey corn muffins and broccoli salad (among the many food options). Delectable fresh fruit kept us somewhat healthy, while a yummy and enormous chocolate and peanut butter frosted cake sated the sweet tooth lovers among us. And how could I forget the beer? Our friend Ed made an extremely generous offer to drive over 2 hours each way to grab some growlers of beer at the Dogfish Head location in Rehoboth Beach. He arrived bearing a most wonderful gift of two large coolers filled to the brim with great craft beers ranging from the sweet Namaste to the savory Chicory, which other delectable choices in between. The crowd went wild for that beer, which paired perfectly with our many chili varieties. In addition to the great food, one of the best parts of the day was seeing the crowd enjoy the company of each other. While most of our guests live within five miles of our house, lots of people commented that the party provided the perfect opportunity to break up their winter hibernation routine. As for me, I thought back to a time fifteen years earlier when I had moved to South Jersey knowing not a soul other than my husband, and had worried that it would be hard to make new friends. When I looked around at the people who were chowing down with us and had enriched our lives during that time span, I realized that food and friendship make for very satisfying connections indeed.